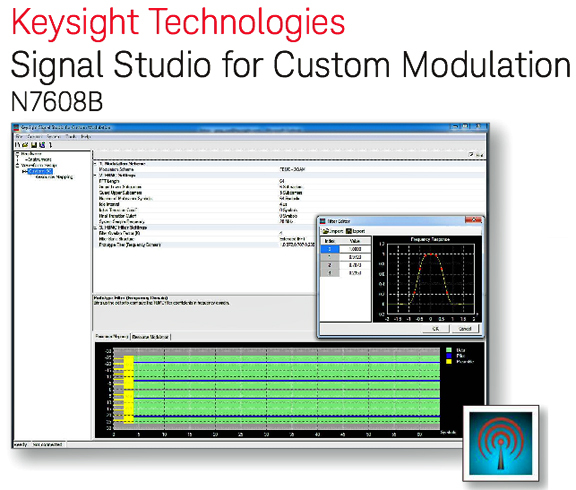 [SatNews] Keysight Technologies, Inc. (NYSE: KEYS) has announced N7608B Signal Studio for custom modulation software. The new software helps speed time to insight by making it easier to create custom waveforms for 5G applications. In the early stages of 5G research, flexibility is the key to investigating new waveforms, frequency bands and bandwidths. Signal Studio for custom modulation provides this flexibility through a suite of tools that enables creation of emerging 5G candidate waveforms, such as filter bank multicarrier (FBMC), as well as custom OFDM and I/Q configurations. For accurate testing of hardware designs, the software provides connectivity to Keysight signal generators and arbitrary waveform generators (AWGs). The new capabilities are also useful in aerospace/defense applications such as military communications and satellites that often utilize custom or proprietary waveforms not directly supported by commercial, off-the-shelf (COTS) test equipment. For these applications, Signal Studio includes custom I/Q quick setups such as digital video (e.g., DVB-S2X APSK), custom SOQPSK and custom OFDM that users can modify to fit their requirements. Signal Studio for custom modulation is also the signal-creation companion to the 89600 VSA software with Option BHK, custom I/Q modulation analysis; and Option BHF, custom OFDM modulation analysis. As an example, a test engineer can save a custom OFDM VSA file in N7608B Signal Studio and recall the setup file in the 89600 VSA software to demodulate and analyze signals. To produce test signals, Signal Studio for custom modulation supports the Keysight E8267D PSG microwave vector signal generator, N5172B EXG and N5182B MXG RF vector signal generators, and M8190A AWG. Keysight is showcasing the software at Mobile World Congress, Hall 2, Booth 2I2, Fira Gran Via, Barcelona. Keysight also will showcase innovations in LTE-Advanced (LTE-A), including 3GPP and Releases 11, 12 and 13. Keysight will demonstrate leading-edge 5G wireless test and simulation solutions in Hall 1, Booth 1E10.